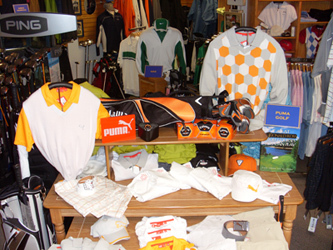 The Elmhurst professional golf shop is committed to offering our members’ current and competitive pricing for all merchandise in our shop. Elmhurst offers extended service and added value to our members during and after the sale of any item through; custom fitting & ball flight analysis, demo try before you buy programs, and after sale follow-up. If you are interested in any item that we don’t currently have in stock, just ask, the professional staff will try to meet your needs and have it brought in for you to try or purchase (just because you don’t see it doesn’t mean we can’t get it). Our shop is equipped with a variety of demo products available to help you decide which one is a perfect fit to your game. Equipment lines from Ping, TaylorMade, and Titleist including drivers, fairway woods, hybrids, irons, wedges and putters. Our professional staff is well trained to provide you with current, accurate club fitting, golf merchandise specifications and details. Our friendly staff provides you with pressure free advice and information to help you in making your decisions. We hope that you will have the opportunity to take a look at the shop’s great selection & pricing soon! Remember, we value your business and will do everything we can to make your shopping experience at Elmhurst a decision you can trust and rely on. 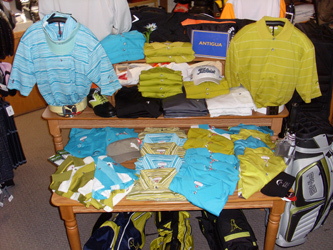 The Golf Shop is able to provide for your corporate business needs. We can provide your business’s logo on merchandise ranging from shirts, bags, hats, balls to accessories. Stop by the Professional Golf Shop and pick up a copy of our Corporate Catalogue and price guide today! Come down for a visit to the Golf Shop and get introduced to our staff. We can’t wait to see you!